Although launched less than a decade ago, Made.com has quickly risen through the ranks to establish itself as a major player in the furniture game. With an amazing team of inspired designers on hand offering incredible, imaginative furniture to help transform your living space, Made.com is a brand you’re really going to love. Why flounder around with flimsy flat-pack furniture when Made.com offers a sensational selection of astonishing options to help you create the home you’ve been dreaming of? With versatile solutions and creative, quality design, Made.com has set itself apart from other humdrum and uninspired furniture suppliers. Why not take a little trip to see Made.com’s range with your own two eyes? It has four showrooms across England, each with hundreds of products on display, so if you’re ever in the area poke your head in and experience an interior aesthetic delight. With Made.com you can shake off the everyday with a glimpse into the extraordinary. How do I use my Made.com discount code? If no code needed, discount is included in the final price! 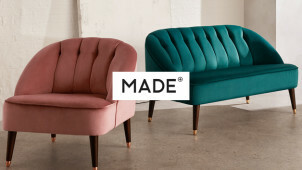 Sign up to Made.com’s newsletter and be the first to hear about their newest deals, discounts and offers. Does Made.com have an app? Streamline your Made.com online shopping experience by downloading its great app, available for iPhone and iPad. Made Unboxed is an amazing place where furniture enthusiasts share photos of how they’ve utilised their Made.com purchases. A collaborative scrapbook of sorts, Made Unboxed is a great place to look for ideas and inspiration, and to share your own. How do I best care for my Made.com products? In order to help keep your purchases looking their best, Made.com offers this furniture care guide. Note that many items qualify for free delivery, and your exact delivery costs will be calculated at checkout. If you wish to initiate a return, get in touch with Made.com within 14 days of delivery. Collection fees may apply. See here for more details. If you’re looking for some eye-catching and affordable designer furniture then look no further than Made.com. With a wide range of beautiful items that you won’t find anywhere else, Made.com can help you craft the home you’ve always had in your mind’s eye. Pick up a Made.com discount code from vouchercloud today and see how much you can save on these incredible products. There’s an amazing variety of elegant, stylish choices on offer from Made.com, so see what takes your fancy today. Made.com doesn’t want to rip off its customers like so many retailers, and by dealing directly with the designers, it can keep its prices low. By sourcing directly from the designers themselves, Made.com cuts out the middleman to offer unbeatable value across the board. Rather than having a supply chain where a huge number of people are taking a cut, Made.com can offers its goods at a price you’re sure to love. Add the finishing touches to your home interior with some purchases from Made.com’s wonderful range of soft furnishings. From cushions and rugs to blankets and bedspreads, there’s a creative, colourful array on display, so pick up a Made.com voucher code and drive a hard bargain on these soft furnishings. A cost-effective way to compliment your space with a refreshing change of aesthetic, you’re sure to love Made.com’s soft furnishings.